Puerto Rico is a vacation wonderland of palm trees, Bacardi, and bioluminescent bays — not to mention excellent major league catchers — but it's also home to some of the most hearty and Instagrammable eats in the entire Caribbean. From whole roasted pigs, to colorful sides, to some of the best rum in the world, PR's food and drink are reasons enough to explore — and given that it's basically the 51st state despite being a Spanish-speaking, Caribbean island, you won't even need a passport to start filling up. Here's what to eat and drink the second you hop off the plane in San Juan. What is it? 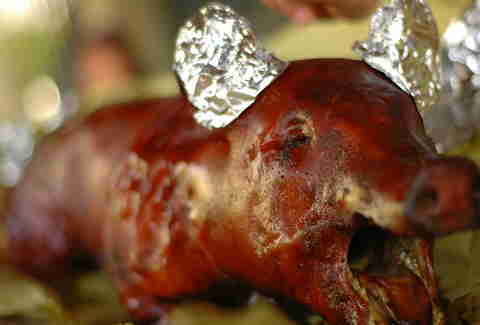 Think Hawaiians know pig roasts? You ain't seen a pair of Puerto Rican pit masters haul a 100-plus-pound hog — with a steel spit through it head to tail — to the butcher's block, where a machete-wielding hombre hacks off hunks of slow-cooked goodness to adoring crowds. The details: The best lechóneras — places where you eat lechón — are roadside stands out in the country where you're free to hang out all day, while everyone from well-dressed families to biker gangs mingle over styrofoam plates of pork and mountains of tasty side dishes served cafeteria-style. Décor doesn't matter when the pig skin is this crackling and the hunks of meat are this juicy. Some say the best lechóneras are found in Guavate, on highway 184 between San Juan and Ponce, but others on the west side of the island, like Lechonera Rancho T in Lares, offer mouth-watering competition. All roads lead to pork. What is it? Sure, roast pig is great, but what to do with all those weird bits like tails and ears? Well, Puerto Rico has an answer worthy of the state fair: Drop 'em in a deep fryer. The results are the dictionary definition of crunchy — and best served with a few frosty beers. The details: Anybody on the island with a line on pig trimmings and a fryer seems to be in the cuchifrito game, so you can find these crispy snacks just about anywhere. Often, you'll end up pulling straight from the just-fried batch baking under a heat lamp rather than having your order cooked on the spot, but if you're that picky about your fried pig's ears, maybe reconsider asking for fried pig's ears. What is it? Wilbur is basically an endangered species in Puerto Rico. The pig theme continues with the island's most dubious sausage, a blend of blood (yep!) and rice that's often served as a side at lechóneras, or just grilled on its own. The details: Puerto Rico draws from its Spanish colonial heritage for this one, with a type of blood sausage that's available everywhere from the motherland in Spain to the southern tip of South America. 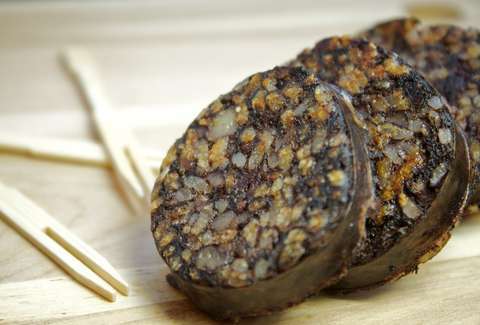 Once you get past the idea of morcilla — there's something Andrew Zimmern-esque about chomping down on what's essentially a blood-filled hot dog — you may find it's actually quite enjoyable. Love 'em or hate 'em, though, these things are exceptionally filling. And again, you can find 'em just about anywhere. What is it? Still have room after eating all that pork? This hearty starch-and-stew combo — which's basically the unofficial official dish of Puerto Rico —will deliver a gustatory knockout blow. The details: Island cooks take their rib-sticking-est stew of beef, chicken, pork, or seafood, then mash it together with a pile of plantains, form it into a mound and smother it in garlicky broth. Purists insist that real mofongo can only be made with crispy pork skin as the base, but there are as many variations on the classic recipe as there are kitchens on the island. 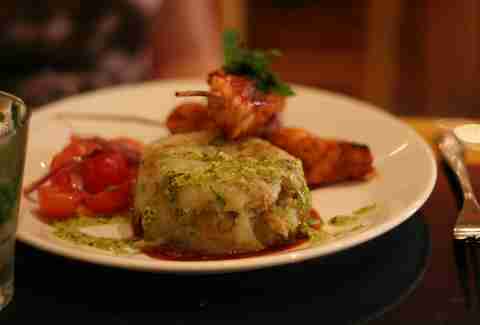 The one thing everyone agrees on: Every version of mofongo should be hearty enough to fill you up for days. What is it? 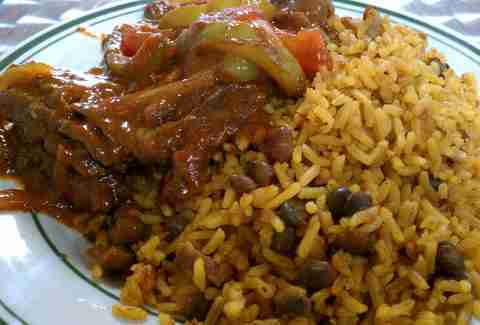 If you didn't know rice and beans could taste this good, it's because you weren't putting enough lard in your recipe. Puerto Rican cooks also go heavy-handed on the sazón — a spice mix heavy on salt, coriander, annatto, garlic, and sometimes MSG — to amp up the flavor of this classic side dish. The details: If you don't eat arroz con gandules every day on your trip to Puerto Rico, it's because you were skipping meals. This staple of the island diet comes as a side with just about everything, but it's so good you probably won't mind. What is it? These caloric depth charges could stand alone as a meal, but they're almost always served (rather ambitiously) as a side dish. See if you can eat two — and still walk out of the place. 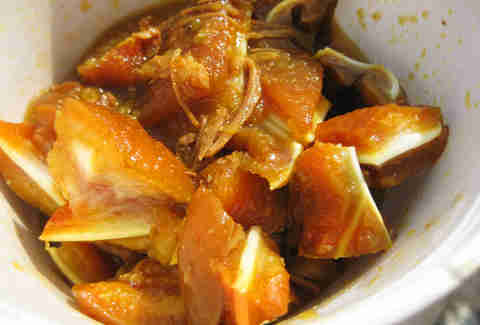 The details: Think of pasteles as the tamales of Puerto Rico: Hearty meat — usually pork, surprise! — wrapped in a dense, heavily seasoned root-vegetable dough that's itself wrapped in parchment paper and a banana leaf before being boiled to completion. Some cooks will embellish theirs with olives, capers or other flavor flourishes. 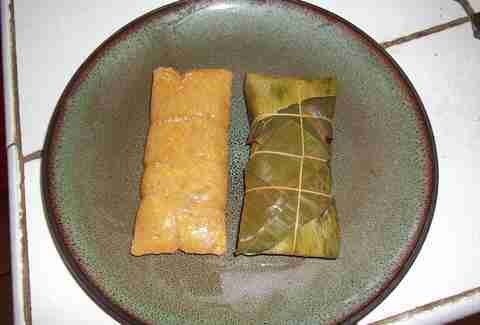 So who makes the best pasteles in Puerto Rico? The grandmother of whomever you're asking. What is it? You can absolutely get french fries in Puerto Rico, but why would you when you can call for a side of these smashed-and-fried chunks of plantain? 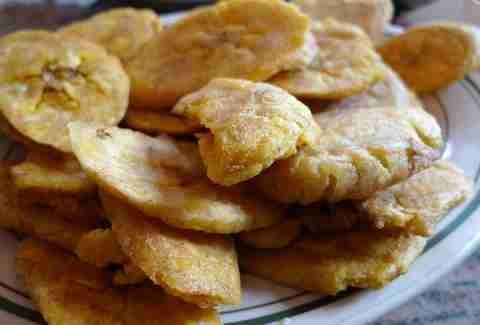 The details: Basically a starchier banana, plantains are sliced, fried, smashed, and fried again (because what is fried is only better when it's fried twice) to make these silver-dollar-sized snacks that also make an excellent side at lunch or dinner. Pro tip: Tostones are often served with a bottle or jar of mojito — not the drink, but a blend of lemon juice, oil, garlic, and spices — that's a great addition to almost any Puerto Rican dish. What is it? 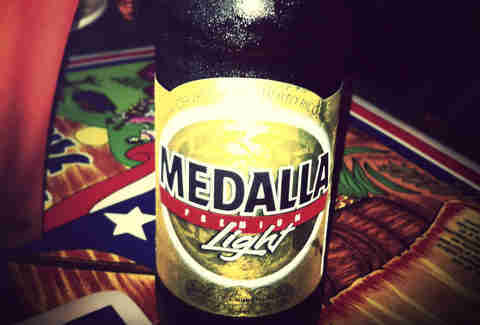 Puerto Rico's most ubiquitous beer, almost always served as ice cold as the air is hot and humid. The details: Medalla might be light, but it's a survivor, having withstood encroachments from foreign brands both American and European to retain the island's easy-drinking throne. You'll start your trip joking about how it goes down like water; assuming you're not there during one of those rare Puerto Rican blizzards, you'll end it thanking god it goes down like water. What is it? Rum! The island is full of distilleries putting molasses and sugarcane juice to good use. 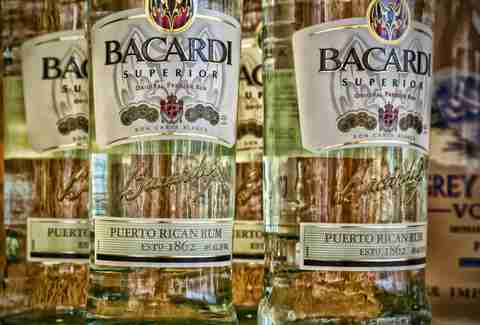 Notables include giant Bacardi, who offer free tours of their "Cathedral of Rum" (so christened by the island's governor back in the 1950s); Don Q, probably the most popular local product; and Edmundo B. Fernández, Inc., the island's oldest operation, founded by the excellently named Fernando Fernández. The details: This is a great opportunity to discover what rum you actually like. On the light end, you have ron blanco (white rum), ideal for mixing with Coca Cola, coconut water, or whatever else you can hustle up. Ron añejo, meanwhile, puts the spirit to rest in wooden barrels, à la bourbon, to impart vanilla and caramel notes; this is the thinking-man's rum, best savored neat. E.B. Fernández's Ron de Barrilito is the aged label to search out, unless the island happens to achieve independence during your vacation, in which case you'll want to sample their Freedom Barrel: a single cask whose opening's been awaited since 1942.